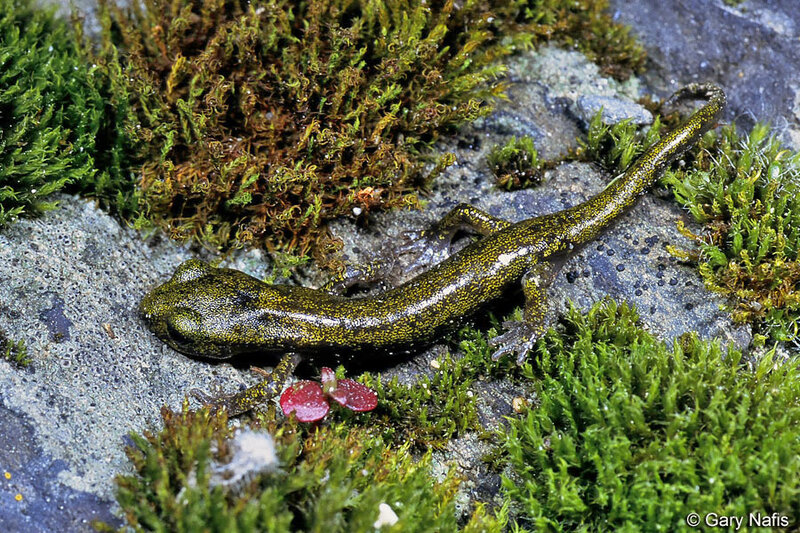 The hind feet have webbed toes to help these salamanders climb steep rock surfaces. 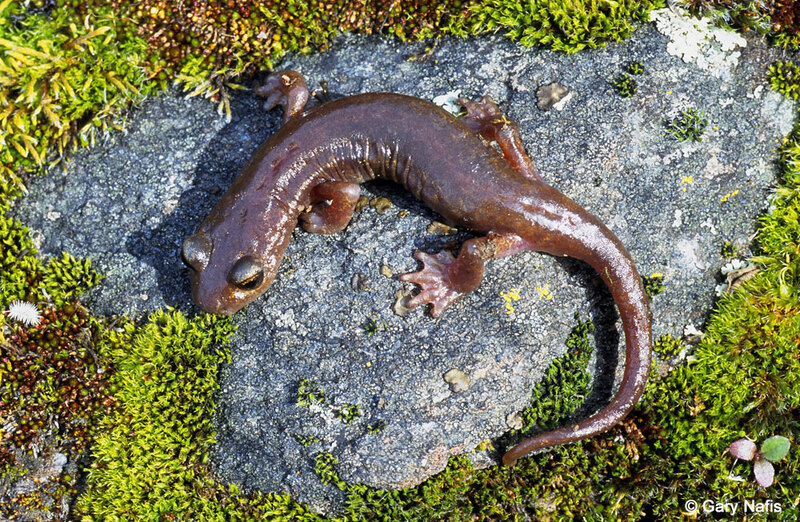 An adult limestone salamander crawls down a limestone rock and underneath another one. 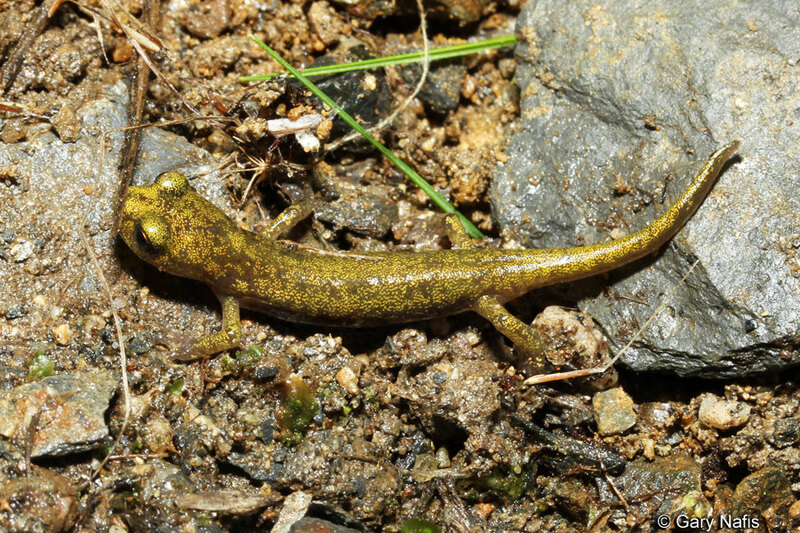 A tiny juvenile limestone salamander is discovered when a rock is turned over. 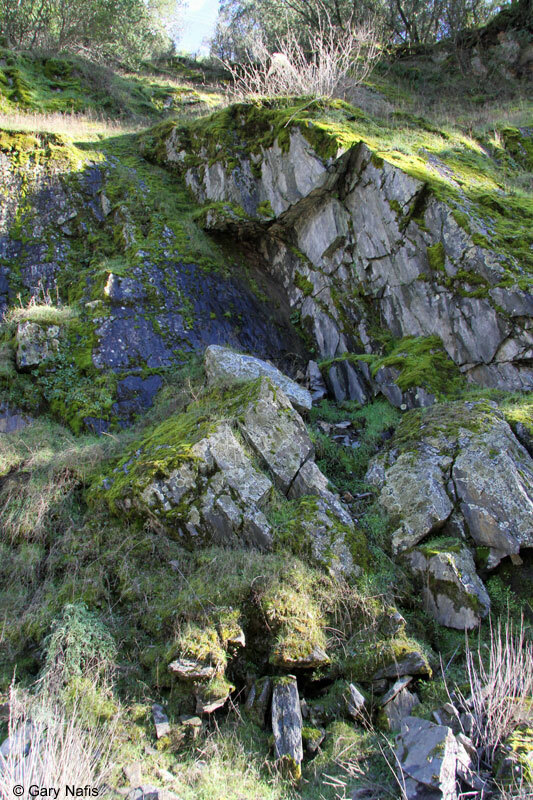 It is allowed to crawl outside of the footprint of the rock before the rock is replaced. Adults measure 2 - 3 inches long (5 - 7.5 cm) from snout to vent length. 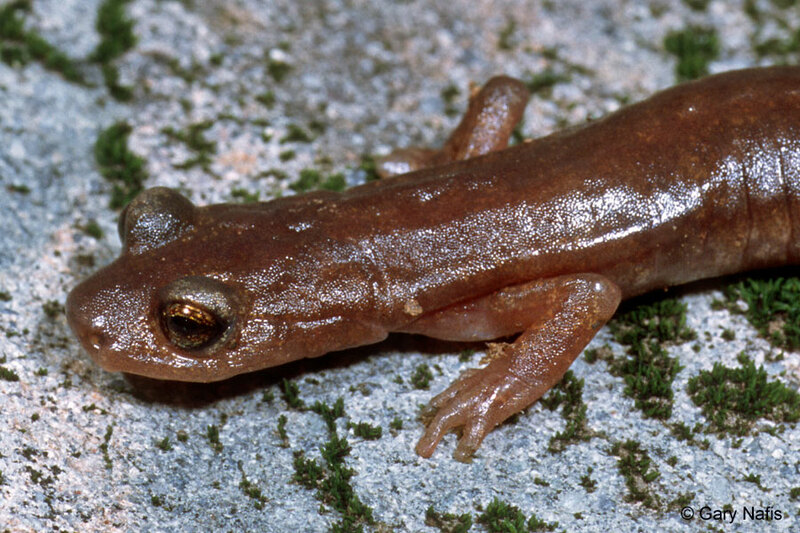 A small stocky salamander with webbed toes, nasolabial grooves, a flattened head and body, and 13 costal grooves. Toe tips of adpressed limbs overlap by 1.5 costal folds. Adults are a brownish color above with a pale ventral surface. Males have an oval-shaped mental gland. Juveniles are yellowish green above, darkening with age. H. brunus is active during wet or rainy periods in fall, winter, and spring when temperatures are not exceedingly low, and inactive during extreme winter weather and during hot, dry periods in spring, summer, and fall. They might also be active in summer well below the surface where there is sufficient moisture - an adult was found active in a mine tunnel in July. Uses its tail and webbed feet to assist in climbing. 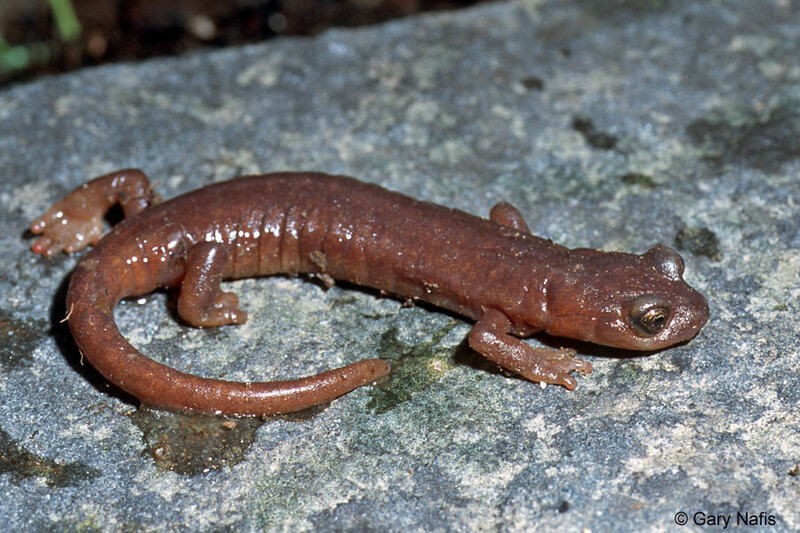 When threatened, this salamander has been observed coiling and rolling downhill to escape. Probably consumes a variety of small invertebrates. Little is known about the breeding habits of this species. Females lay eggs most likely in deep moist talus or crevices in late spring. 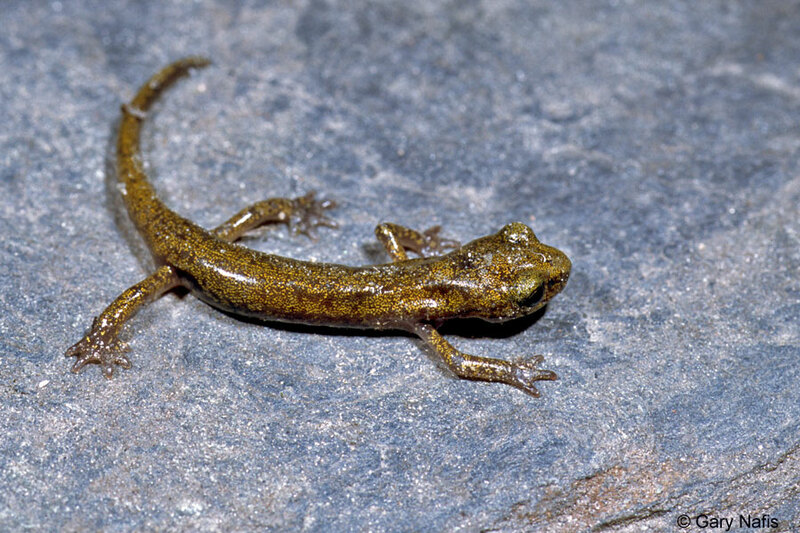 Young develop completely in the egg and hatch fully formed in the summer..
Summer is hot and dry in the range of the Limestone Salamander, so hatchlings probably remain underground until at least the following fall rains. 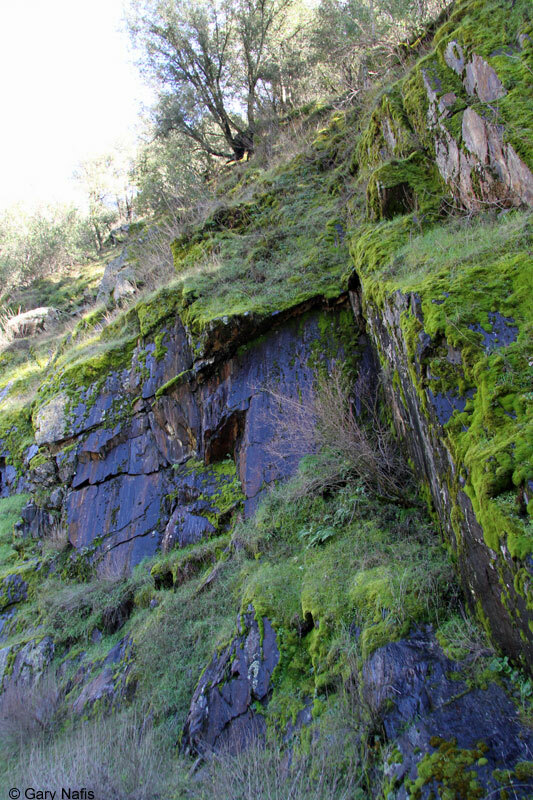 H.brunus inhabits mossy limestone crevices and talus in the Grey Pine, Oak, Buckeye, Chaparral belt of the lower Merced River Canyon, typically on steep slopes. Has also been found in abandoned mine tunnels. Endemic to California. 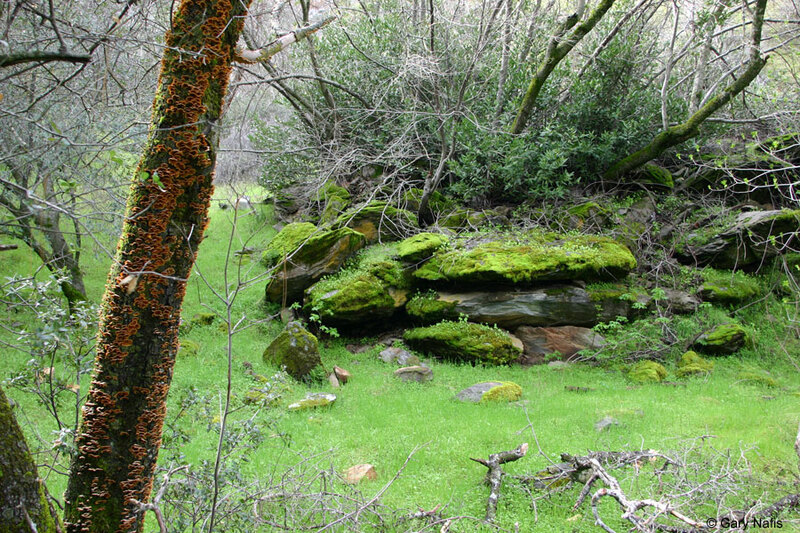 Found along the Merced River from Lake McClure to about 4 miles NE of Briceburg, Mariposa County. 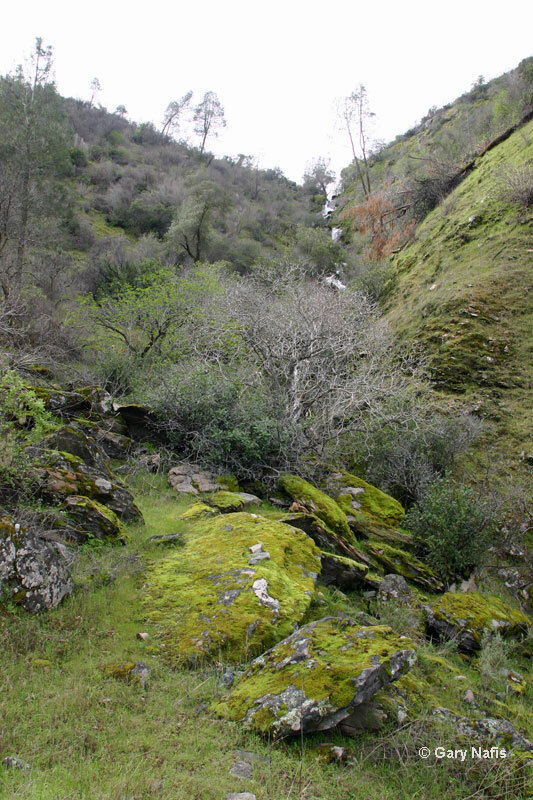 Also occurs along the Merced River tributaries including Bear Creek and its feeder creeks, south of Briceburg. Discovered in 1952, H. brunus has always been considered a distinct taxon. 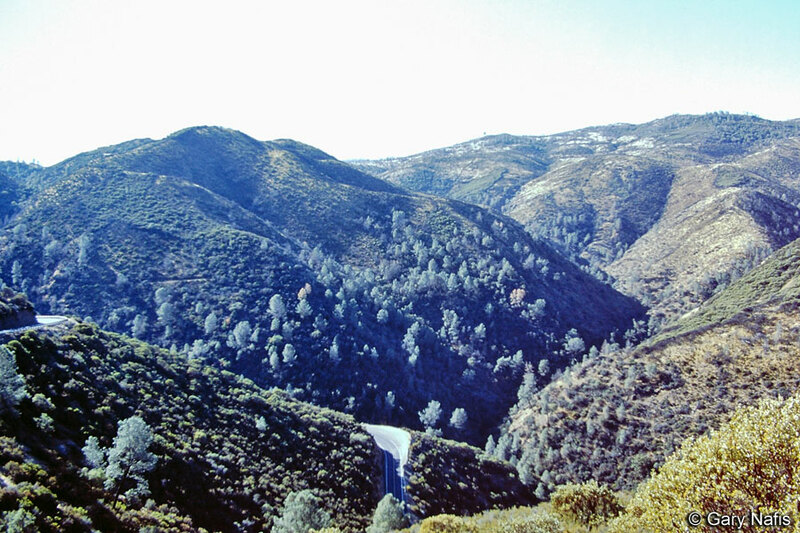 H. brunus is one of five species of Hydromantes, all of which are endemic to California. The others are the three Shasta complex Hydromantes and H. platycephalus. 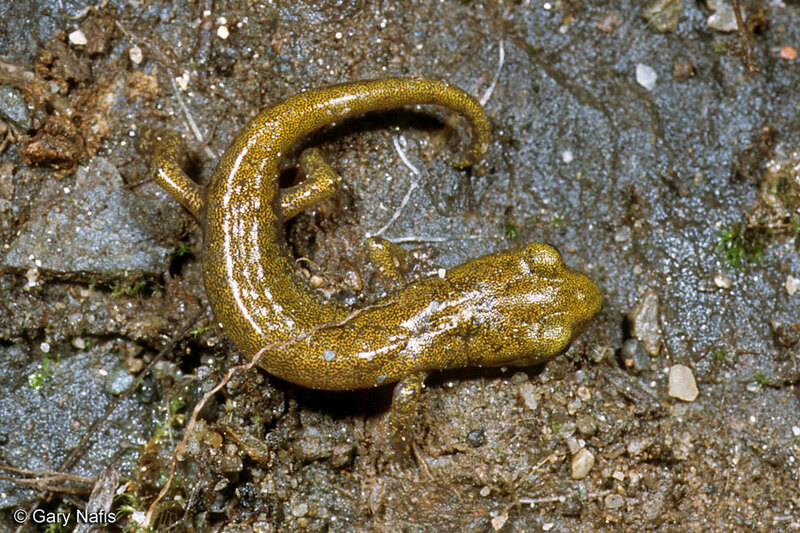 Eight species of similar salamanders once placed in the genus Hydromantes but now placed in the genus Speleomantes occur in Italy and southern France and on the island of Sardinia. 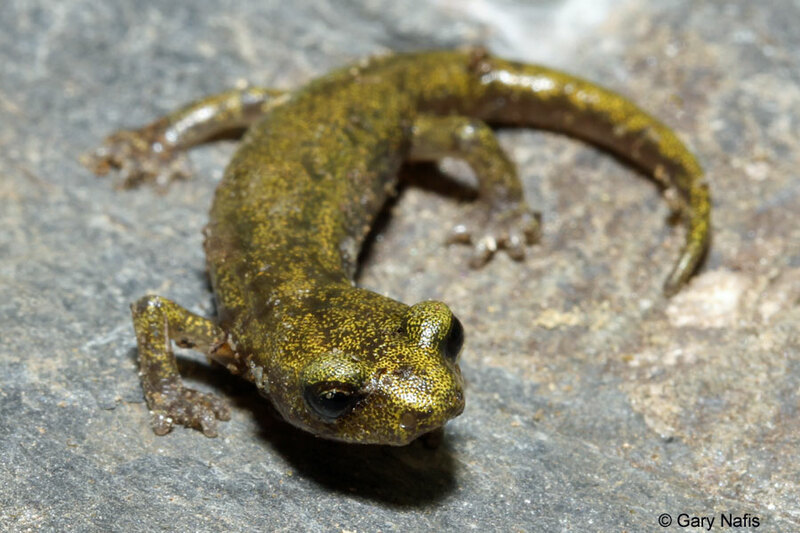 They are the only plethodontid salamanders found outside of the Americas. 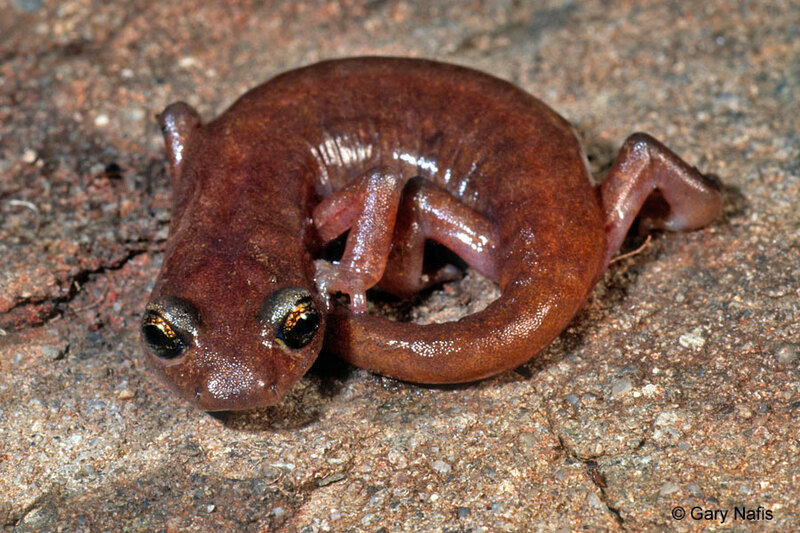 (A new species of lungless salamander found in Asia in 2004 was placed in a new genus.) Why Hydromantes/Speleomantes are found only in Europe and California is still a biogeographical mystery. "Rovito (2010, Mol. Ecol. 19: 4554–4571) evaluated genetic variation in both mitochondrial and nuclear genes in H. brunus and H. platycephalus and those data supported the hypothesis that H. brunus was derived from H. platycephalus by peripatric speciation. Thus H. platycephalus is paraphyletic, but no changes in its taxonomy were suggested." 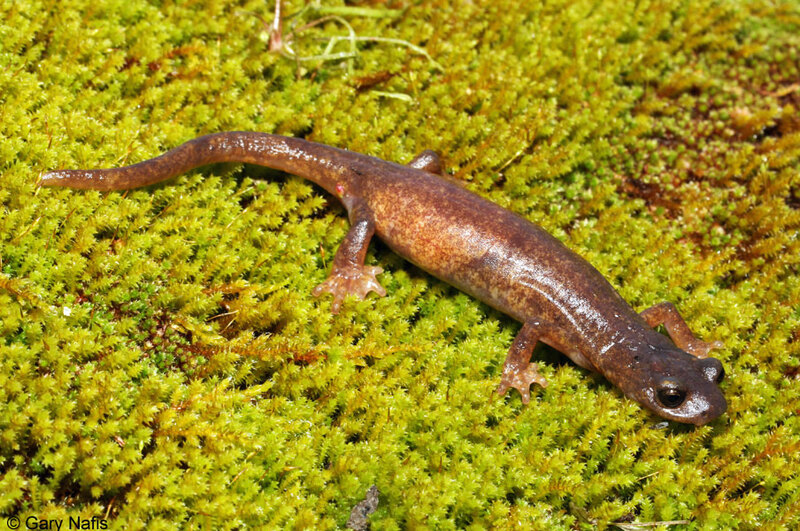 This salamander is listed as a threatened species by the state, due to its limited range and habitat, although there is no indication that their range or population density have decreased or changed significantly. But there have not been any discoveries of new populations in many years, either. brunus: Latin - brown, referring to the color of adults.